Case 1: Numbers greater than 50. In both the cases, we need to take 50 as the base value. First let us take 'Case 1' i.e. 'Numbers greater than 50'. Consider this answer in two parts: 29 (first part) and 16(second part). Now let us study, how Vedic Math can help us to achieve this answers or both of these parts. As we are taking '50' as base, so the number presentation will be like 50 + 4. So the first part is 50, and second part is 4. Pick the first part i.e. 50. And we get our first part of the answer i.e. 29 (25 + 4). As we are taking '50' as base, so the number presentation will be like 50 + 11. So the first part is 50, and second part is 11. And we get our first part i.e. 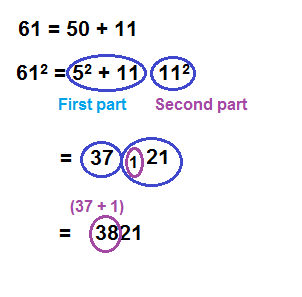 36 (25 + 11). So the answer is 3721. Refer to image below for visual representation. Now, let us study 'Case 2' i.e. Numbers lesser than 50. As we are taking '50' as base, so the number presentation will be like 50 - 2. 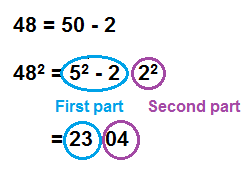 So the first part is 50, and second part is (-2). For numbers below 50, we take the deficiency from 50 (2 in this case), to get the number (48 in this case); and use the square of the deficiency (22= 4 in this case) for calculation. And we get our first part i.e. 23 (25 + (-2)). So the answer is 2304. Refer to image below for visual representation. In the second case, we explore the sub-sutra "Whatever the deficiency lessen by that amount and set up the square of the deficiency"
Try it. I hope by now you would have understood the method. Even then if you have any difficulty, post your doubts here. Enjoy!! Please do share your views that would be having great value for us and will encourage us. 2.) Pick the last digit of result. i.e. 6 and remeber carray i.e. 1. 3.) Now multiply each digits with next digit and then multiply every by 2. i.e. 5 X 4 X 2 = 40. 4.) Add last carry in the result. i.e 40 + 1 = 41. 5.) Now repeat step 2. 6.) Now multiple the first digits with itself. i.e. 5 X 5 = 25 and add carry in it.i.e 25 + 4 = 29. 7.) Get together all last digits and at the last the full number.